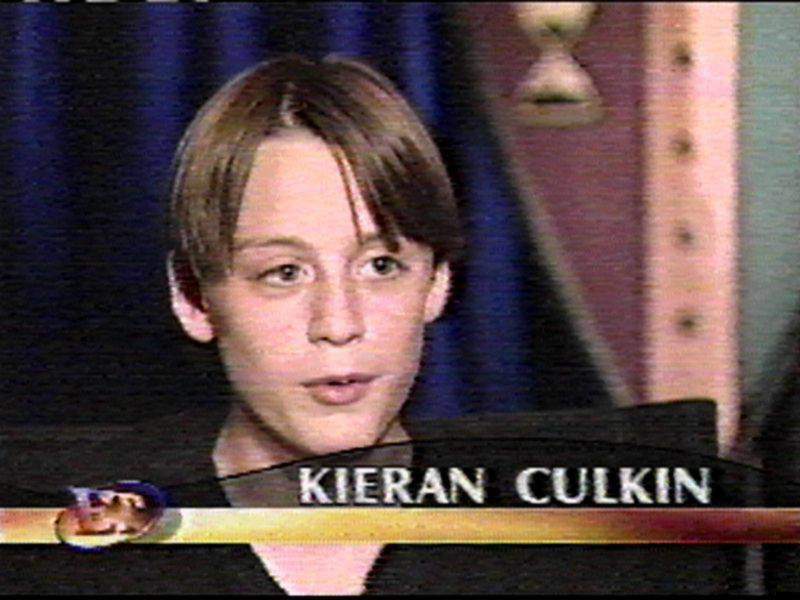 Here is a transcript from Kieran Culkin on the Tonight Show with Jay Leno. 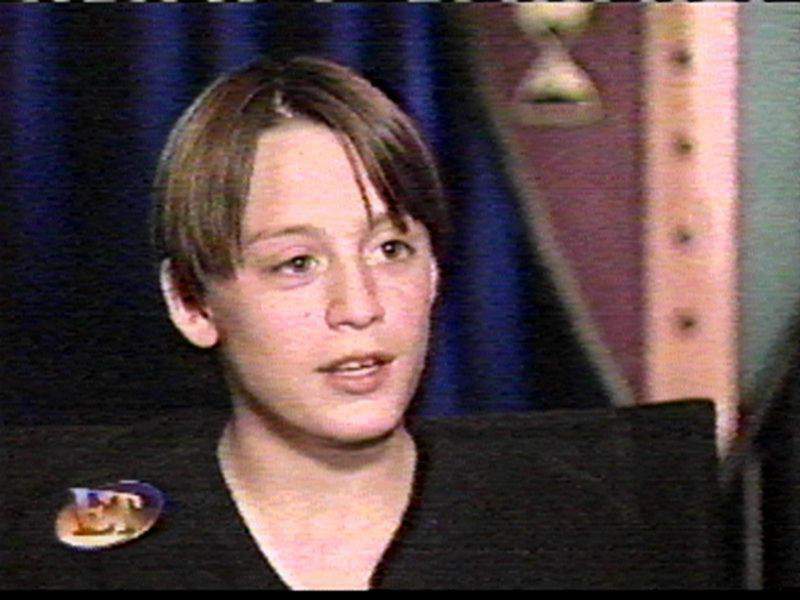 Jay Leno: Our next guest, a talented young actor, he's getting terrific reviews for his new movie "The Mighty" can be seen in a theater near you, please welcome Kieran Culkin. JL: Happy Birthday, you just had a birthday. KC: September 30th, I'm 16. JL: Ok, did you get your drivers license, did you do that whole thing? KC: No, I live in New York, you don't need a car there. JL: Really, see, that's the first thing, when I got to 16 I couldn't wait to role my mom's Falcon, that was sort of the big deal. Then within a week I had an accident. So you have no desire to get a license? KC: No, no, I'm a New Yorker dammit! JL: And the dammit proves it. JL: So did you have a big party, the whole family? KC: Uh, yea, my whole family was there and a couple friends, and a lot of presants! JL: And there is a lot of, how many in your family, how many kids? KC: I have 4 brothers and 2 sisters. JL: Ok, well that's pretty big. 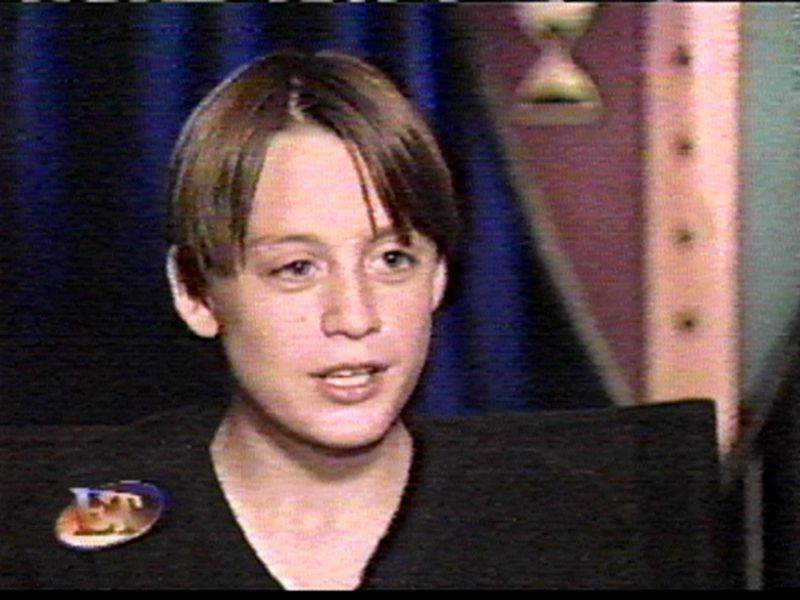 I know your brother Macaulay just got married, recently, right. JL: Now did you, uh, was that a big wedding? KC: It was a very small wedding but it was beautiful, it was great. JL: He was, what was he, 18 or 19? KC: He was uh, I think he was 17, yea, he was 17 when he got married, he turned 18 in August. JL: Wow! Would you wanna get married in two years? KC: (looks at audience) Uh, I don't know, is anyone single or free? (girls start whooing) JL: Well, there you go. KC: I'm gonna get dressed up every year, I don't know how long I'll be trick or treating, but maybe I'll be 80 years old and still trick or treating. JL: Did you guys go out, did you and your brother like hang on Halloween or did you go your own seperate ways, did you go out together? KC: Uh, we always went together, up intill a certain point, but he used to play tricks on me on Halloween. KC: Um, when we were really little, I remember I'd always wear this Casper mask, it was like the third year in a row I was Casper, and I really hated it, and my brother Mac, he had a devil mask, and I wanted the devil so badly, I'd always beg him, I asked him, please can I have the devil mask, he said no no, it's my mask. One time, we're out on the streets of New York trick or treating, he runs up way ahead of everybody, with the devil mask on, and does trick or treating there and gets a lot of candy, comes back to me and goes ok, you can have the devil mask and we switch masks, he takes the casper, we go in there, say trick or treat, the guys like no no, you already came here, no candy, no candy for you. I missed out on all the candy. KC: But, I told my mom about it, and uh, she made him give me a lot of candy! KC: Oh yea! I ended up with a lot more candy than he did. JL: So what are you doing this year, what are you going out as now? KC: Oh you do, yea, I saw that. JL: Did you see me, now, were you rooting for me? KC: (takes deep breath) No. JL: Now what do you mean no, what is that, you were rooting for Hogan and that idiot Bischoff? KC: Yea, I'm an NWO fan, what can I say? JL: Oh man, now ya see your guys got slapped around. KC: Yea yea, but you see, that wasn't all you, you didn't get the win, that was your man Kevin over there. JL: Kev, we're a team, Kevin and I are a team. JL: (does ddp sign at Kieran) Here buddy, right here, that's right. JL: Did you bet money on that fight? JL: Good thing you didn't cause you would of lost! Big time! KC: I would of lost. JL: Big time! Ok, now tell me about "The Mighty" I must say you did a wonderful, ya know, I saw this film and I had no idea what I was seeing, I just knew, there is this new movie and you were gonna be on, and ok, and Sharon is in it, and everything, I was really blown away, I thought it was a wonderful, wonderful story. Tell folks who you play and a little bit of what's it about. JL: Is that like muscular distrophy or something? KC: Uh, all I know about it is that your body grows to a certain point like Kevin Dillon's body grew to age 14, but his organs, like his heart and his brain keep growing. JL: Well, it's really a wonderful story, and it's not like a kids story, it's an adult story that adults and kids can like, I mean, I just thought it was very enjoyable. JL: Here it is, oh, here you're going to see your friend who's like, I always call him the big dumb guy. KC: The big, uh, naw, that's not true, he's not dumb. JL: Well, in the beginning that's what you think he is, but he's not really like that. KC: This is the scene where they form the partnership. JL: Yea, lets take a look.